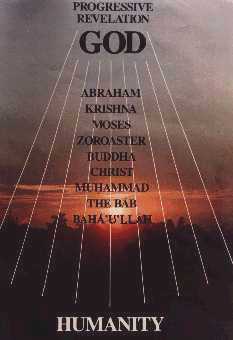 He hath manifested unto men the Day Stars of His divine guidance... and hath ordained the knowledge of these sanctified Beings to be identical with the knowledge of His own Self. Whoso recognizeth them hath recognized God. If thou wilt observe with discriminating eyes, thou wilt behold Them all abiding in the same tabernacle, soaring in the same heaven, seated upon the same throne, uttering the same speech and proclaiming the same Faith. As the human race has developed through time we have gradually understood more clearly the world around us. During our progress God has sent us Messengers whose Messages were according to our understanding in the time during which we lived. 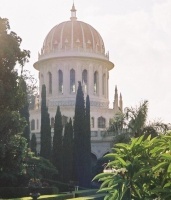 Bahá'ís believe that the Messenger of God for this moment in time is Bahá'u'lláh, His forerunner was called The Báb. Navigate between pages using the arrows or return to the Index Page using the symbol icon.